We try to make travel easy, which is why this website has a lot of one day city itineraries that are perfect for first time visitors. The problem is that cities usually have a lot to offer, WAY too much to fit into one day. Still, it's better to get a taste of what a city has to offer and sample its most popular attractions. There's no point in poring over travel guides or spending hours planning your travel itinerary if you don't have to. For first-time visitors who want to get a quickie overview of a city's highlights, there are a few quick and easy ways to accomplish it. Which one you choose is mainly dependent on your budget and how much time you have. If you have only a few hours between flights, you can take a private layover tour Search for a guided tour here. Some airports offer free tours. If you have more time, you can take advantage of the HOHOs—hop on/hop off tour buses. It is an easy way to learn about its history, the “must-see” sights, and takes you to them. 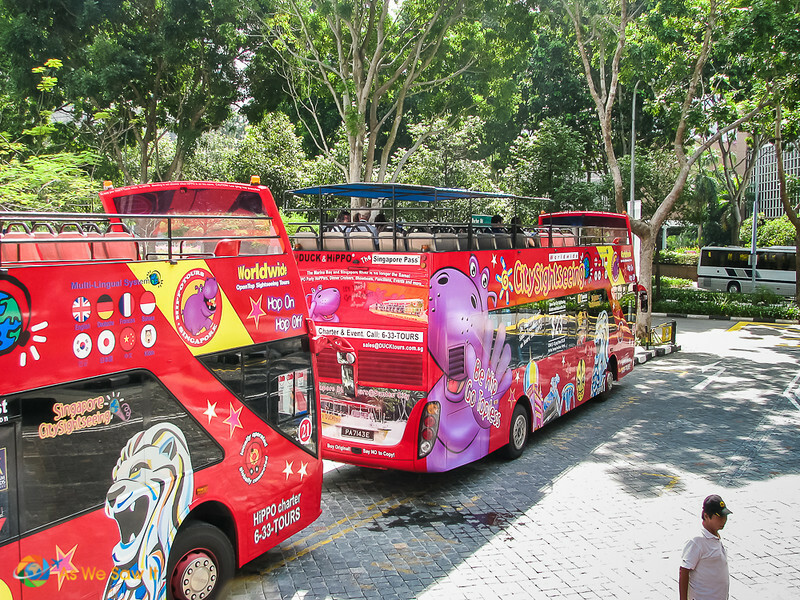 Many companies offer them; we have been pleased with City Sightseeing. Read more: 7 Airports That Offer Free Layover Tours. How does a hop on hop off tour work? The tour bus is usually an open-top, double-decker variety that goes on a set loop around the city. Sometimes, they offer more than one city itinerary. It depends on the size of the city and how spread out the attractions are. Passengers listen to a recording that shares history and interesting facts about the city through the provided earphones. When one of the attractions seems interesting, you hop off at the nearest stop to check it out. Afterward, you return to the stop and hop on the next bus. That's how the hop on hop off bus got its name. People call it the HOHO for short. Tip: Take your earphones with you when you get off the bus. Even better, bring your own earbuds. The ones they provide are uncomfortable. Why take a bus tour? The bus goes to parts of the city you probably wouldn't have time to see on your own. The included narration gives you a good overview of the city's history in a short time. It helps you understand the layout of an unfamiliar city and better gauge distances as you plan the rest of your sightseeing. The route is intended for visitors, not locals, and stops are located near popular tourist locations. The stops are varied and appeal to a variety of interests. Tip: Don't take a bus tour if the traffic is bad; you'll waste too much time. Pop into a hotel and ask the concierge if there's a tourist map; it will show where all the attractions are. The tour company has already worked out the best way to see the most important parts of the city in the least amount of time. It saves a lot of time and effort by showing those sights that need little more than a drive-by (like Admiral Nelson's statue in Trafalgar Square). It also makes it more fun by taking you by others you may not have known about. The bus will stop at major locations so you can “hop off” to visit a site, then “hop on” another bus when you're ready to move on. If you don't hop off, the entire route takes about 1.5 – 2 hours, traffic permitting. These bus tours offer either a taped narration or a live guide. Buses with taped narration offer hookups with multilingual channels while live guides usually give the tour in English. Tip: If you don't like the tour guide or sound system, take the first opportunity to hop off and wait for the next bus. Check the City Sightseeing website. Don't fancy a bus tour? We have partnered with Get Your Guide to offer you unique tours, specially tailored to your interests. Click here for more information. Ticket prices vary but are generally competitive for all companies in a city. A rough budget is $30 per ticket, depending on location. Some companies also offer a less expensive night tour, which might be ideal if your time is extremely limited. Two-day tickets usually offer a better value, especially in large cities with multiple routes (north-south, east-west, historic, etc.). Validity: Some tickets are valid for one calendar day while others are good for 24 hours, so check the terms carefully. To get the most value out of a day ticket, we recommend beginning early. On the other hand, if a ticket is good for 24 hours you can begin in the evening. Hours: Be sure to ask when the last bus stops at your stop in the evening. Be prepared to get back to your hotel on your own if you lose track of the time. We got stuck on the other side of town when our driver kicked everyone off the Prague tour bus at 6:00 p.m. Check for bonus opportunities. 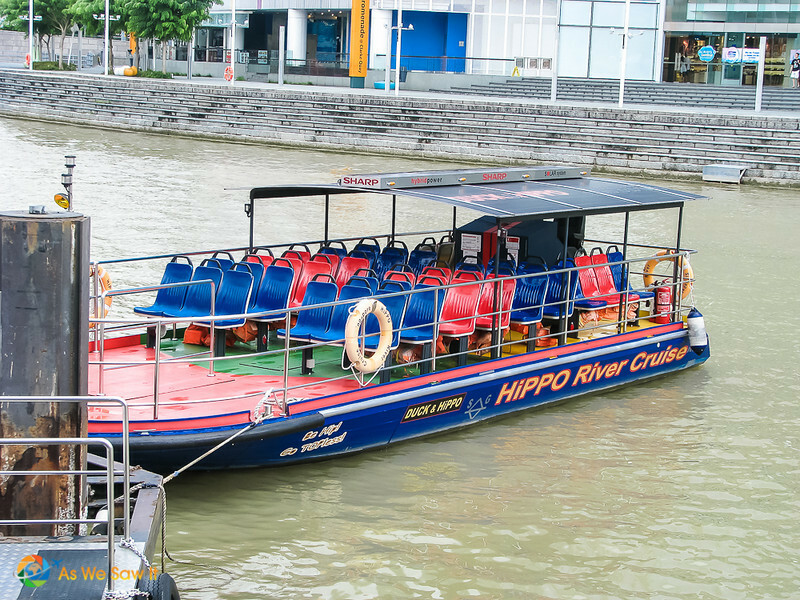 For example, our Singapore and London tickets included a river cruise in the price of the ticket. Bonus tip: The earphones provided are uncomfortable and don't fit well, so it can be difficult to understand the narration. If you have a favorite pair of ear buds, bring them along. It will make your tour a lot more enjoyable. Just remember to take them with you when you hop off! You’re right, Anisa. When only one highlight is important to someone, they should focus on that. You guys are so good at covering a lot of territory in a day. We very seldom go to a city for just one day, but I have to agree that taking a bus tour is the best way to get a feel of the place and find out a lot about it. I think the hop-on-hop-off idea is not even that old. 25-30 years ago there were only bus tours, but they didn’t stop in any place. Or am I wrong? I think you’re right about that, Anda. Growing up outside of NYC, I only knew of the Gray Line bus tours that shuttled tourists around Manhattan. Though to be honest, I never took one, so I can’t be sure…. Totally agree that the hop ons are the best way, even if you have a couple of days. When we visit a city I always feel I didn’t see everything I wanted to but have finally reconciled myself to the thought that you can’t see everything! You’re right, Jackie. There are so many things to see and do just around where we live – no wonder some people don’t have passports!